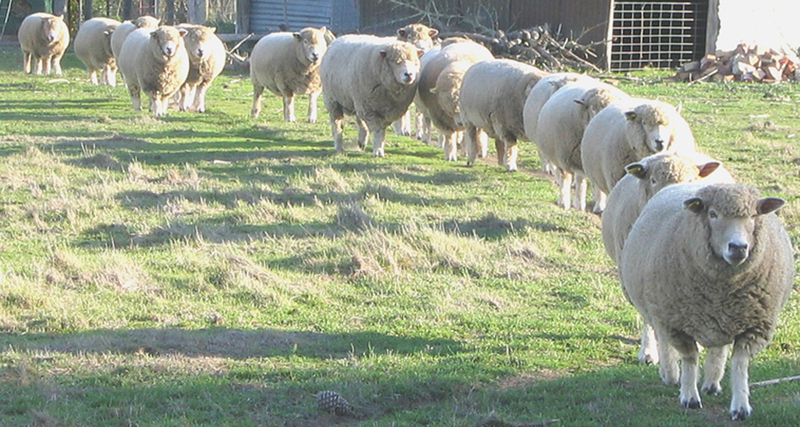 There are currently only 15 Ryeland studs in Australia consisting of less than 600 breeding ewes between them, with over 50% of the ewes owned by only two breeders. This puts this breed in a very vulnerable position. Once a popular terminal sire of prime lambs, the naturally hornless Ryeland was used in the development of the Poll Dorset to introduce the polled (hornless) gene. Ryelands are a white-woolled sheep with dark hoofs and nose leather - there are no coloured Ryelands in Australia..
Ryelands are quiet sensible sheep and are easy to handle. They are easier on fences than some breeds and can be grazed in orchards without damaging trees. Ryeland ewes are excellent mothers with few lambing problems and we wean between 150 and 200% lambs. At Peartree the aim of the breeding program is to produce true to type Ryeland sheep with good constitution and excellent temperament. We keep only a small number of ewes which allows us to give individual attention to our sheep and to enjoy their delightful personalities. Regular faecal tests are conducted to reduce unnecessary use of chemicals. Pear Tree is a registered stud with the Australian Stud Sheep Breeders' Association. The Stud is Brucellosis Accredited and since 2005 all lambs have been vaccinated against OJD.